This lovely climbing rose is a popular addition to many gardens. 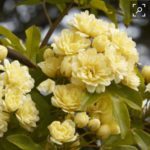 The Banksia Rose, (Rosa banksiae ) or Lady Banks Rose, originated in China, and is named after the wife of famous botanist Sir Joseph Banks. An evergreen rose with few, if any, thorns, it is a dense climber to about 6 metres – perfect for covering a fence or pergola. Masses of creamy yellow or white flowers are produced on long canes from spring onwards. The flowers have a delicate fragrance, some say reminiscent of violets. This vigorous rose needs a well-drained soil in full sun or part shade where it won’t crowd out other plants. First fill the planting hole with water. This is important for two reasons. How quickly the hole drains indicates whether drainage is good or you will need to plant the rose in a raised mound. If the surrounding soil is not damp when you transplant, the water you apply after planting will be drawn away from the root ball into the surrounding dry soil, and the plant will look stressed several days after planting. The addition of compost to the planting hole, and a 5 cm layer of organic mulch to the soil surface, is very beneficial. Keep the mulch one hand width from the stem. It is a hardy plant but it should be watered weekly for the first couple of months after planting if weather is dry. Then, only water when the top centimetre of soil is dry. Climbing roses are pruned after flowering. Banksia roses are usually pruned by late summer when the main flowering flush has finished. As these roses flower on last season’s wood, just remove any damaged canes, and shorten the rest of the canes by one third. Hard pruning results in no flowers next spring. Prune new roses during First Quarter phase when sap flow is higher and growth response will be faster. This entry was posted in Ornamentals and tagged Aussie gardening, Australian gardening, backyard vegetables, Banksia rose, climate change gardening, climbing rose, easy gardening, easy organic gardening, environmentally friendly gardening, flowers, garden soil, gardening advice, gardening diary, growing ornamentals, growing plants, Healthy soil, how to grow, Moon Planting diary, New Zealand gardening, organic fertilisers, organic gardening, plants, propagating, Rosa banksiae, self-sufficient gardens, soil pH, sustainable gardening, what to grow. Bookmark the permalink. I have 2 established banksia roses (1xwhite 1xyellow). I’ve removed the trellis they were on as it was collapsing and had to cut them back to ground level. Will they come back from such a harsh pruning? I honestly don’t know, Diane. This rose blooms from old wood and experts advise avoiding severe pruning of old branches. You haven’t said where you live, so I don’t know what conditions your area is experiencing. As a perennial, Banksia roses can store carbs for growth in their root system and may produce shoots from the base. I would say keep the soil around it just damp, and keep your fingers crossed.